Construct a projection evaluator for a specific state space. Return the dimension of the projection defined by this evaluator. Compute the projection as an array of double values. Define the size (in each dimension) of a grid cell. The number of sizes set here must be the same as the dimension of the projection computed by the projection evaluator. After a call to this function, setup() will not call defaultCellSizes() or inferCellSizes() any more. Set the cell sizes to cellSize for a particular dimension dim. This function simply calls getCellSizes(), modifies the desired dimension and then calls setCellSizes(). This is done intentionally to enforce a call to setCellSizes(). Multiply the cell sizes in each dimension by a specified factor factor. This function does nothing if cell sizes have not been set. If cell sizes have been set (irrespective of source; e.g., user, default or inferred), this function will then call setCellSizes(), so the source of the cell sizes will be considered to be the user. Get the size (each dimension) of a grid cell. Get the size of a particular dimension of a grid cell. Check if cell dimensions match projection dimension. Sample the state space and decide on default cell sizes. This function is called by setup() if no cell dsizes have been set and defaultCellSizes() does not fill the cell sizes either. Set the default cell dimensions for this projection. The default implementation of this function is empty. setup() calls this function if no cell dimensions have been previously set. Check if the projection dimension matched the dimension of the bounds. Check if bounds were specified for this projection. Set bounds on the projection. The PDST planner needs to known the bounds on the projection. Default bounds are automatically computed by inferCellSizes(). Get the bounds computed/set for this projection. Compute an approximation of the bounds for this projection space. getBounds() will then report the computed bounds. Perform configuration steps, if needed. Compute integer coordinates for a projection. Compute integer coordinates for a state. Get the parameters for this projection. Print settings about this projection. The state space this projection operates on. The size of a cell, in every dimension of the projected space, in the implicitly defined integer grid. 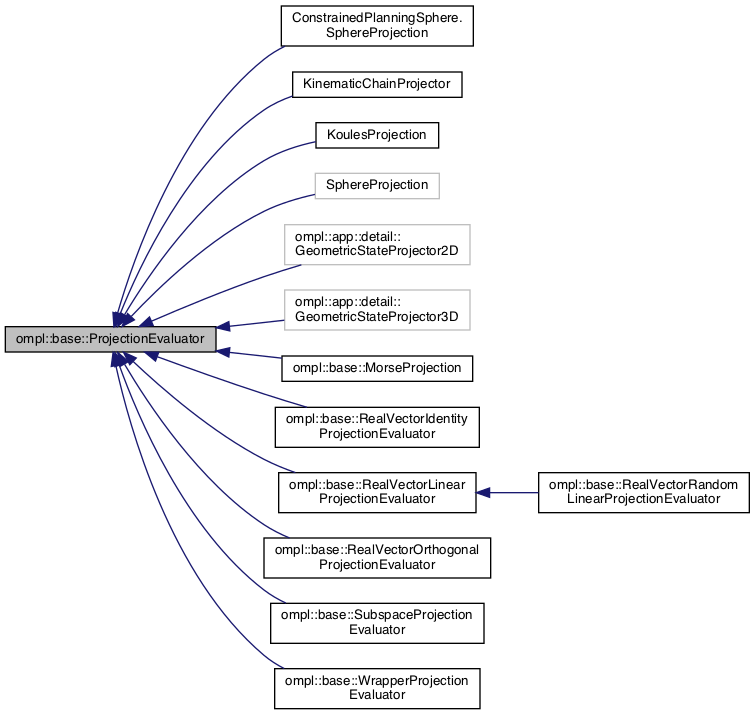 A bounding box for projected state values. An approximate bounding box for projected state values; This is the cached result of estimateBounds() which may later be copied to bounds_ if bounds are needed but were not specified. Flag indicating whether cell sizes have been set by the user, or whether they were inferred automatically. This flag becomes false if setCellSizes() is called. Flag indicating whether projection cell sizes were automatically inferred. The set of parameters for this projection. Abstract definition for a class computing projections to Rn. Implicit integer grids are imposed on this projection space by setting cell sizes. Before use, the user must supply cell sizes for the integer grid (setCellSizes()). The implementation of this class is thread safe. Definition at line 127 of file ProjectionEvaluator.h.